So this was the craft that Connor brought home from school yesterday. I really didn't look at it until I strapped the kids in the car and got in myself. And I was perplexed. "Thank you for the blue shirt Connor". Um, what? I now realize I was reading it wrong. I was reading it like a thank you note and couldn't for the life of me figure out why someone was thanking Connor for a blue shirt. Just then I jumped out of my car and asked another mom what her daughter's craft said and her's said she was thankful for her cousin. Then it struck me...aww, thankful, not thank you! But thankful for a blue shirt? So as I was backing up, I asked Connor what he was talking about. He said he was thankful for the little boy's blue shirt. And then, seconds later, a little boy (in a blue shirt) from his class goes walking by and Connor points at him and excitedly says "That little boy mama. I am thankful for his blue shirt." 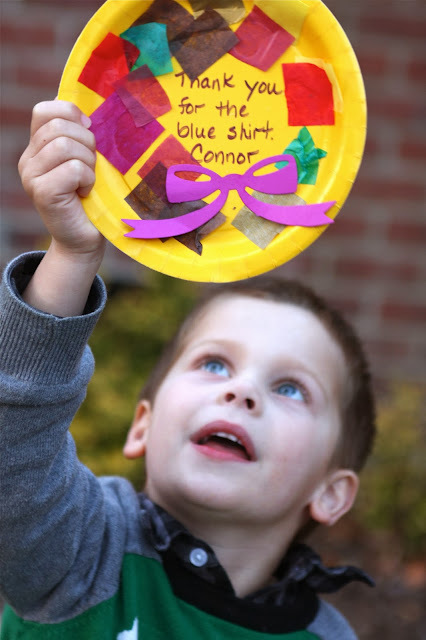 Why Connor is thankful for that little boy's shirt, I am unsure. But most days I am unsure of the thought process of a 4 year old. So what are you thankful for this Thanksgiving? <3 I am thankful for the mama of a little boy who notices blue shirts! Happy Thanksgiving friend!